I first heard Alfred Cortot when I was a boy. The magic of his recording of Chopin’s Étude op. 25 no. 1 made an indelible impression on me – it made me almost gasp. It wasn’t just the incredible beauty of his sound but also the flexibility of his timings – especially the way he stretched the melody line, and the personal stamp he brought to it. It makes me hopping mad when people go on about the numerous wrong notes in his recordings. Would that they could begin to hold a candle to playing of such genius, flawed as the results sometimes were. But these surface blemishes (which would not pass the censors nowadays, admittedly) detract from the playing not one iota – besides, he admitted he hardly had time to practise, busy as he was with his teaching, conducting, administrative duties and touring. In my student days, a teacher lent me Cortot’s edition of Chopin’s B flat minor Sonata, a work I had been studying for a while. After just one week of practising the exercises, my playing of the piece improved dramatically. I rushed out to buy his edition of the Sonatas, and both books of the Études, published by Salabert (and ferociously expensive they were too). I still use them all the time, not just for the exercises Cortot designs, but also for his fanciful and poetic running commentaries which illuminate the music wonderfully. The only drawback is that the score has been sloppily edited (I’m not sure who was at fault there) with quite a number of wrong notes, so it is not advisable to use these editions as the sole source, rather as a supplement to a more reliable Urtext edition (I still prefer the good old Paderewski edition of Chopin). But it was not just to the music of Chopin that Alfred Cortot turned his hand – the Editions de Travail, in 26 volumes, embrace Schumann, Liszt, Weber, and more. The essential principle of this method is to practise, not so much the difficult passage taken as a whole, but the particular difficulty it presents by reducing the latter to its elements. The principle will hold good for all pianoforte practising; it does away with mechanical work which degrades the study of an Art essentially featured by sensibility and intelligence – and though it may appear superficially slow, ensures in fact definite progess. Alfred Cortot, foreword to Frederic Chopin: 12 Studies Op.25 (ed. Cortot), Salabert. Even though Cortot belonged to the finger school of piano playing, he realised the importance of diagnosing the technical problem and coming up with an array of exercises that focus on it. Doing the mechanical work on the exercises rather than in passages from the music is a great idea. Then, when you go back to music, it all works so much more easily, as though the hand had been lubricated. I do have one caveat though: many of the exercises operate on the principle that from Cortot’s “etc.” you will continue the pattern. This might be transposition, but often seems to involve a pair of fingers in ever-increasing stretches, and I find myself constantly warning students only to stretch as far as is completely comfortable and to AVOID the sometimes unnatural and potentially damaging extremes of stretch he suggests. Other than that, I find if you use these exercises, not only do you learn the piece so much quicker and more thoroughly, but you can transfer the thinking behind them to other pieces. This brings me full circle to last week’s post on inventing exercises, and rounds off this series of posts. I will leave you with Cortot’s recording with Casals and Thibaud, of the first movement of Mendelssohn’s evergreen Trio in D minor, a work it was my pleasure to have been coaching this weekend. Since I published this, Christine Stevenson alerted me to her most interesting blogpost. Check it out here. Lovely! Happy memories of my teacher, who, having studied with Cortot in Paris, insisted on my using Cortot’s editions. Ah 🙂 Great post, Graham! @Bradley – I must have introduced you to these editions during our work together, eh? I too am amazed by Cortot’s interpretations. 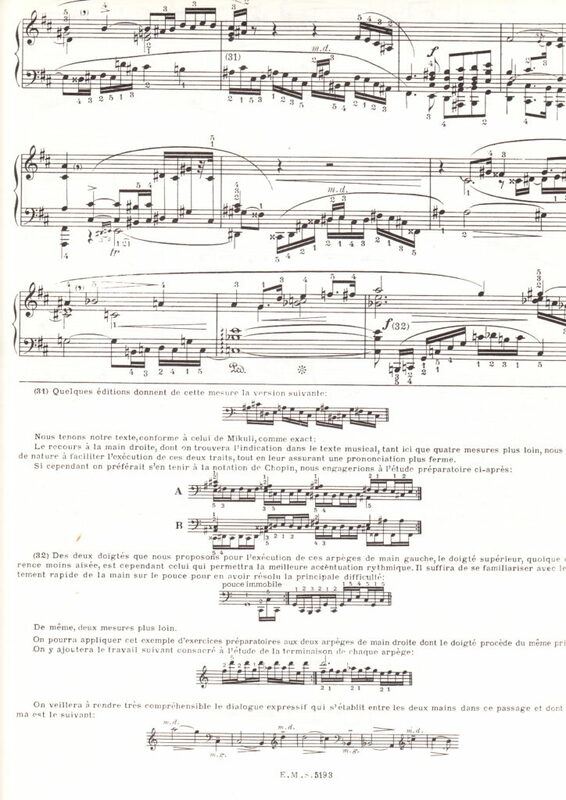 I’m currently working on the Opus 10 études using not only the Cortot study edition, but “Les 24 études de Chopin: vers une interprétation” by the wonderful Monique Deschaussée (a prominent student of the maître himself). It’s a great complement! and worth checking out. Thanks Dwayne – I know the name but am not aware of her book. I will certainly check this out.